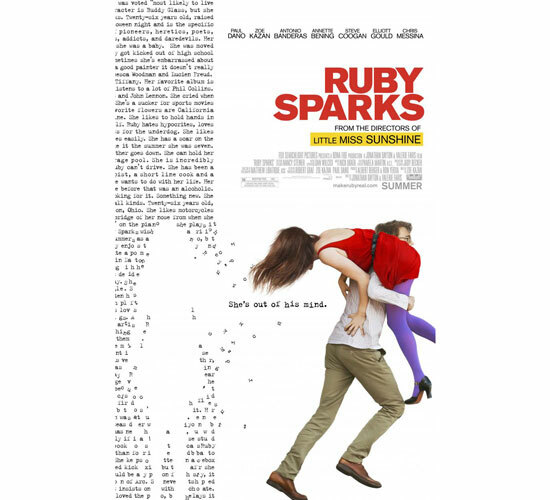 Ruby Sparks is a story about a writer and his relationship with his creation. Paul Dano’s Calvin is a New York Times bestselling author who is suffering from writer’s block. Calvin is first seen in front of his typewriter not typing when his phone rings. From the look on his face, he welcomes the distraction. Later on, he blames his dog for his writing woes. His writing problems have him going to a psychologist, portrayed by Elliot Gould, who suggests he write about his dog, Scotty, named for F. Scott Fitzgerald. He finally becomes inspired to write from his continuous dreams about a girl, Ruby Sparks, portrayed by the movie’s screenwriter, Zoe Kazan. He writes about her instead of his dog. The movie starts off slow, but picks up speed once Calvin starts talking about Ruby to Gould’s Dr. Rosenthal. It becomes more interesting and the dialogue is quick and funny. Ruby becomes alive, but is it only in Calvin’s mind? When Ruby is first seen making Calvin breakfast, the audience doesn’t know if she is a real person or just a figment of Calvin’s imagination. The way he’s acting, it is easy to think he’s going nuts. It’s not shown until other characters interact with her. Then it becomes real to Calvin and to the audience at the same time that Ruby Sparks is a real person. Ruby just appears. There is no use of a time machine, spell, or prayer plot device used to explain how she came to be. The only thing that is shown is when Calvin types in his manuscript that Ruby speaks French; she does. It is easy to suspend disbelief. So it isn’t hard to think that when she magically appeared, she had a history, an apartment, and any other possession that a person has if they have been alive their entire life. Calvin now has a girlfriend. He’s happy, but not for long when his creation starts getting a mind of her own. She starts spending time with her friends. This makes him pull out his manuscript where he writes that she is miserable without him. This makes her so clingy that she doesn’t leave his side. This makes for some funny scenes from him buying movie tickets to them sitting on the couch, always with him with one arm around her. There is no personal space between them. Before the end of the movie, Calvin comes back to his manuscript numerous times, learns some valuable relationship lessons, and writes another book. Overall, the movie is funny, entertaining, and very romantic. This movie was directed by Jonathan Dayton and Valerie Faris, who brought audiences the hit Little Miss Sunshine. The movie also stars Annette Bening and Antonio Banderas.